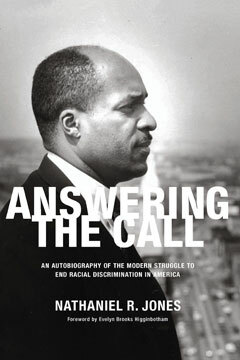 Answering the Call is an extraordinary eyewitness account from an unsung hero of the battle for racial equality in America—a battle that, far from ending with the great victories of the civil rights era, saw some of its signal achievements in the desegregation fights of the 1970s and its most notable setbacks in the affirmative action debates that continue into the present in Ferguson, Baltimore, and beyond. Judge Nathaniel R. Jones’s pathbreaking career was forged in the 1960s: as the first African American assistant U.S. attorney in Ohio; as assistant general counsel of the Kerner Commission; and, beginning in 1969, as general counsel of the NAACP. In that latter role, Jones coordinated attacks against Northern school segregation—a vital, divisive, and poorly understood chapter in the movement for equality—twice arguing in the pivotal U.S. Supreme Court case Bradley v. Milliken, which addressed school desegregation in Detroit. He also led the national response to the attacks against affirmative action, spearheading and arguing many of the signal legal cases of that effort. Judge Jones’s story is an essential corrective to the idea of a post-racial America—his voice and his testimony offering enduring evidence of the unfinished work of ending Jim Crow’s legacy.